Rocko and Heffer join a health club in hopes of losing a few of those unsightly pounds. Rocko gets his very own credit card, and Heffer convinces him to go on a spending spree at the mall. Feeling unwanted by her husband, Mrs. Bighead invites neighbor Rocko over to ""fix a few things around the house."" But little does our wallaby hero know of Mrs. Bighead's ulterior motives. When Heffer is forced out of his parents' house, he decides to come and live with Rocko. Eventually, though, the two roommates' very different lifestyles start to conflict with each other. Rocko and Heffer experience the ups and downs of traveling by airplane. Rocko tries to get an extremely reluctant Spunky to take a bath. Meanwhile, a situation comedy - starring two microscopic parasites - plays out on Spunky's fur. Ed Bighead wants to dispose of Rocko, so he tips off a home inspector of Rocko's messiness, so Rocko must cean up before the nspector comes. When Rocko gets puuled over by the police because his gas cap is missing, his car gets into the pound and he has to go through driving school all over again, where Rocko is repeatedly warned not to have ""the fat guy"" as an instructor. Rocko is appointed temporary boss of the Comic Book Store, while the real boss, Mr. Smitty, is away. Rocko soon goes mad with power, and takes his aggravation out on his only employee - hapless Filburt. One day, while dining at the local fast-food joint, Heffer accidentally chokes on a chicken ribcage. During his lapse of consciousness thereafter, Heffer has a ""near-death experience."" Rocko and Heffer visit a dude ranch, and while there, Heffer starts to fall in with a crowd of bad cattle. Rocko scrambles to gather up his trash and put it out, since he's missed garbage day for the past few months. Not to make things any easier, the local mad dog, Earl, is on the loose - and he seems intent on destroying both Rocko's trash AND Rocko. Rocko and Heffer go to a baseball game, in hopes of catching a foul ball. Rocko orders a brand new vaccuum cleaner, but when activated, the device goes out of control and starts sucking up everything in sight. Rocko gets fired from his job at a huge Comic Book emporium, and subsequently sets out to seek other avenues of employment. He eventually lands a job at Conglom-O, where Ed Bighead is eager to place him in a dangerous occupation - as a product tester. Rocko and Heffer go to the local carnival, and Rocko is intent on winning something. But it's not as easy as he thinks, because these O-Town carnival games are actually rigged. Rocko and Spunky take a trip to the beach, in order to avoid a day of brutal heat. Through a coincidence, Rocko, Heffer, and Mr. & Mrs. Bighead wind up sharing a cabin together on a winter vacation. Filburt cons Rocko into being his patient for a big dentristry exam he has to take. Rocko tries to make it to the local supermarket in time for a massive 99%-off sale. Rocko becomes sick with the flu, and if he doesn't get better soon, he'll miss the chance to go to the big WWWWF wrestling show. Heffer invites Rocko over to his parents' house for dinner. 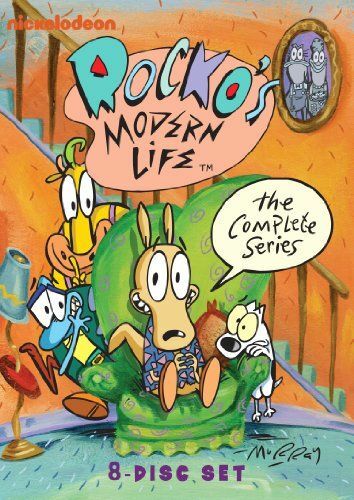 There, Rocko sees just how dysfunctional a family can be. After Rocko tells Heffer that he is actually adopted, he sadly runs away to find his biological family. Rocko tries to get over his crush on his beautiful next-door-neighbor, Melba. Heffer tries to help by setting Rocko up with an assortment of dates (via personals ads), but each and every one of them ends in disaster. Spunky becomes romantically smitten with an old rag mop, despite Rocko's constant attempts to dissolve the unhealthy ""romance"". A.) Rocko finds out that Ed and Bev have a son they have disowned because they are ashamed he is a cartoonist. Rocko and Heffer love his show ""The Fatheads"" and they try to reunite the family. Ed has a nervous breakdown right before a big proposal is due. Bev writes the proposal and then makes an Ed costume that Heffer and Filburt wear to give the speech. Rocko's plumbing is all clogged up, thanks to Heffer. They call a plumber, but it is much too expensive. They try to fix it themselves and that's when they find what the problem is. Rocko has to have his appendix removed. Rocko hallucinates and makes friends with Pinky, his appendix. Rocko and Heffer go on a road trip. Rocko buys a new entertainment system and Heffer gets sucked into it. The Elves move in next door to Rocko. Rocko invites everyone, including the Elves, to Rocko's Christmas party. When Ed Bighead spreads a nasty rumor about the Elves, nobody shows up. Rocko is erroneously going to be deported, so Filburt marries him in order for Rocko to stay in the country. Rocko has to deliver comic books over the snowy mountain. Heffer and Rocko decide to spend the extra time (and money) doing a little skiing. Bev adopts Earl as her pet. Earl acts viciously to Ed but like a pussycat to Bev. Rocko feels very short until he does something very big. Rocko is competing in the Jack Hammer finals, but has a problem with his eyesight. When Filburt is sick, Heffer and Rocko ""bird"" sit Filburt's problem bird, Turdy. When Heffer birdsits in a literal sense, they panic about Filburt finding out. When Heffer discover his talent of burping, he goes to the talent show. He wins, with the prize being a trip to Astro-Camp in outer space, but Heffer's dad won't let him go, since he thinks that burping his way to Astro-Camp is ridiculous. Rocko becomes the next ""victim"" for the Chameleon Bros. newest ""scam."" Filburt fights his fear of Halloween. Rocko investigates the Bigheads when he thinks Bev has done in Ed. Bev gets a nose put on by accident, but she can't stand the smell of Ed. Ed is having an middle-age crisis and tries to recapture his youth by hanging out with Heffer, Rocko, and Filburt. Ed's ""bug prisoners"" escape to Rocko's to live the better, and uneaten, life. Rocko and Heffer go to France only to meet up with a crazed bus driver, miss all the important sights, eat Chokey Chicken, and fall in love. Spunky gains a great deal of weight, providing a new adventure for Bloaty and Squirmy, and a great deal of pain and nausea for Rocko's Modern Life fans. Filburt, O-Town's newest Mr. Lucky, receives a horrible fortune and bad luck follows him everywhere. Rocko's kitchen is destroyed by a government ""satellite"" right before his big party. He must find any way possible to remodel as quickly as possible. Rocko and Heffer find themselves on ""The Nosey Show"" after a big fight. A.) Mr. and Mrs. Bighead's son, Ralph, is a famous animator. When he decides he wants to be let out of his contract, he lets Rocko, Heffer, and Filburt be in charge of his new series. B.) Wacky Deli enjoys continued success despite Ralph's attempts to sabotage it. Filburt decides he is going to pop the question to the woman of his dreams, Dr. Hutchinson. Dr. Hutchinson's and Filburt's plans for the wedding create a chaotic situation for everyone involved. Heffer must bring home an elk for ""dinner"" in order for him to become an adult. O-Town begins a massive musical and most incredible recycling campaign. Heffer and Filburt compete for Rocko's friendship after Rocko wins two tickets to a wrestling match. Mr. Bighead, while sleepwalking, thinks he's a pirate and tries repeatedly to get a treasure map from Rocko. Heffer suspects that he is being targeted for revenge after his practical jokes get out of hand. Rocko, Heffer and Filburt are arrested during a raid on an Easter Bunny ring while caring for Filburt and Dr. Hutchinson's egg. Rocko and Mr. Bighead run against each other for the office of Dog Catcher. Rocko prepares for a visit from grade-school bully, Dingo. Rocko and Heffer read fairy tales, with a bit of improvisation, to Filburt to entertain him as he recovers from a cold. Heffer moves out of his parent's place to prove he's capable of making it on his own. Heffer faces the wrath of a spirit that he wronged in a former life. Rocko tries to get a love letter back that was intended for his mail carrier. Ed Bighead earns a series of promotions by relying on a ""Magic Meatball"" (kinda like a ""Magic 8-Ball"") to make business decisions. Ed Bighead has trouble accepting the fact that he enjoys being a clown. Rocko and Heffer's friendship is strained when Rocko unwittingly finds fame as a high-fashion underwear model. Heffer unknowingly trades his soul for an opportunity to be on a TV game show. Rocko takes up roller-skating to impress a girl. Rocko is arrested after a game of Doorbell Ditch gets out of hand. Filburt talks Rocko into going wig-snatching with him. Heffer overdoses on Pasture Puffies (a snack food said to contain potentially harmful substances) and is rushed to the hospital. While he is in a coma, Rocko, Filburt, and the Bigheads reminisce about past experiences with the steer. Rocko tries to protect the Thanksgiving Turkeys that have taken refuge at his house. After Mr. Bighead, as Grand Marshall of the O-Town Founder's Day Parade, rejects Rocko's parade float entry, Mr. Bighead, Filburt and Heffer tell their versions of the founding of O-Town.